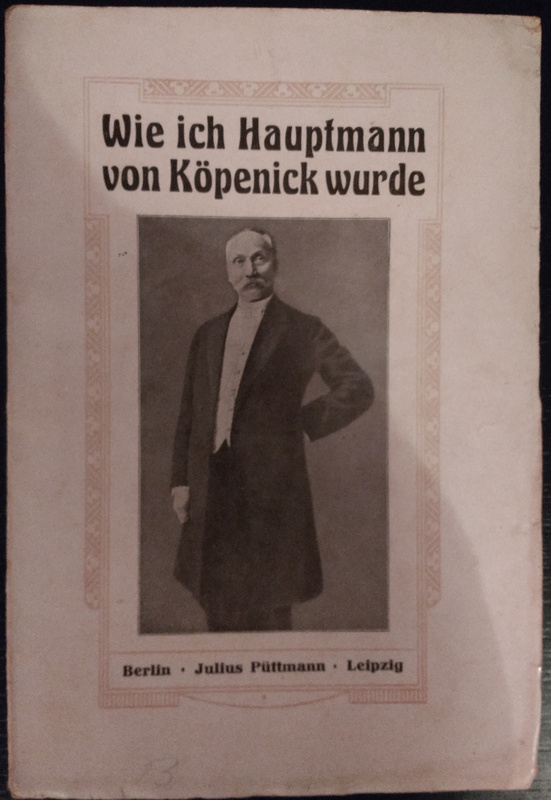 The Hauptmann von Köpenick was a petty crook who in 1906 dressed up as a prussian officer, commandeered some passing troops and used them to imprison the treasurer and the mayor in Köpenick Rathaus while he escaped with the contents of the safe. Somewhat surprisingly many people, including (angeblich) the King, found this amusing and when caught he was sentenced to only four years and pardoned by the King after two. Hardly the harsh militaristic Prussian state one expects. The small exhibition and statue at Rathaus Köpenick is one of the few things left to see that would drag me back to the post-German horror that is modern Berlin. Anyway, the story is better explained here, and the Heinz Rühmann film from 1956 is quite amusing. I’ve always liked the story, and finally last week found a first edition of his memoirs from 1909. 120 Euros or so, but it makes me happy.